Infinity War - !!! !SPOILER ALERT!!!! Discussion in 'Disney Chat' started by Tokaji, May 1, 2018. This April, the heroes of the universe came together to beat back the evil villainy of the badguy Thanos. No one agreed on anything; everyone fought; but still, they did their level best to repel the darkness in this Titan's mind. Now, we will do the same! You've seen the movie (or don't care about spoilers) and have been awed by (or perhaps disturbed by) Thanos' excellent animation and the pulsing vein in his neck. You've cried over Gamora's death; you've laughed at Thor's friend Rabbit; you've shaken your head in disbelief at Peter Dinklage being cast as a giant dwarf; you've stared in disbelief as Loki got crushed in the first ten minutes (sorry @pretty Omi) Here's where you can let it all out! I saw this posted on another forum. CCofRR13, maxtrexmom, Tokaji and 1 other person like this. I was upset at how weak Vision was...I mean come on dude, you defeated Ultron!!! I wish there was a moment when everyone was at the same place at the same time, there could've been some funny moments. I loved Thanos before and now I like him even more. True, he was scarier to me in my mind, now he's a likeable villain. I understand your viewpoint Thanos! Lol what other villain have we ever seen cry? Although the movie ended abruptly for me I'm happy he succeeded. I thought it was hilarious that they made Tyrion Lannister a giant...funny and not funny at the same time if that makes sense. I agree, could've been better, but what other movie can't? Still enjoyed it because I love superhero movies and I'll take what I can get...but I do hope the next one is so much better. Forgot to mention Hulk...WTH dude, you can't get scared! Get angrier! Even Bruce was not his usual self in this one. I like how Panther's sister questioned the way they made Vision...would've been nice if she had a moment with Tony too. Hulk isn't scared! He's too prideful! He got beat, and it hurt his pride, so now he won't do it again. Nice try Corey, he was scared senseless! Trust in the Doctor y'all. My boy wouldn't lead the universe astray. Same Doctor who gave the Time stone away? He probably saw a future that'll fix everything later, one where Tony should play a part in. 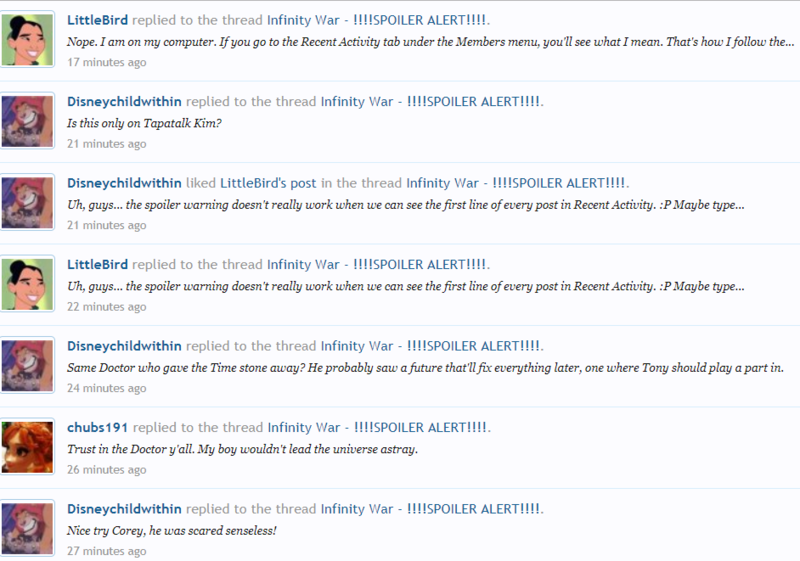 Uh, guys... the spoiler warning doesn't really work when we can see the first line of every post in Recent Activity. Maybe type something random in the first line and then hard return to the next line? Is this only on Tapatalk Kim? Nope. I am on my computer. If you go to the Recent Activity tab under the Members menu, you'll see what I mean. That's how I follow the forum, and I don't think I'm the only one. Not trying to rain on anyone's parade. Just wanted you guys to be aware. Hmmm, I can't see posts...I only see the titles of the thread. Huh. Are you using a phone or tablet? Maybe it only shows the first line on PCs. Or maybe I'm just special. It depends on how you access the summary page. If you click the "New Posts" link toward the top of the page you only see the discussion subject. But if you are like me and prefer to use this link to see a little more: Recent Activity | Disney Pin Forum you see the below. Disneychildwithin and LittleBird like this. So yeah, as my friends have been seeing the film, I keep getting messages of "Sorry for your loss" haha... I was expecting it. He sacrificed himself for Thor. It was an honorable death. Maybe they'll bring him back with the others? I can have my hope. Snort laugh moment was "I am Steve Rogers"
I'm on computer using Firefox, and my sidebar only says who posted and the thread title, not any of the text. I wonder if posting a photo first will block any of the text underneath? Like, if I preface every one of my posts with my favorite image related to this movie? Re: Dr. Strange giving up the time stone - he did say that they succeeded in one of the 14M+ futures that he saw, and then when he offered up the stone in exchange for Tony's life he said that this was the only way. My guess is that that one successful future was brought about by doing what he did. He told Tony earlier that he would rather sacrifice Tony than the stone, but that was before he saw the futures. GreyWyvern and Ajk like this. I really, really, really wish this movie had the stakes it supposedly does. I know Gamora's dead, and Loki's dead, and Vision is a goner. But if the next film ends up being "Avengers: The One Where We Undo Everything Thanos Just Did" instead of "Avengers: The One Where We Kill Thanos for Being The Worst," I'm gonna be annoyed. And yes, I know there are lots of Spider-Man and Guardians and Black Panther and Thor movies in the works, but that doesn't mean their timelines have to take place after Infinity War. The only death I didn't cry over was Loki's (sorry Omi, you were also the first person I thought of during that scene! ), but that was more because I was in shock than anything else. I didn't really expect them to kill off as many characters as they did in this film, which may have been naïve of me. I cried a lot over this film, which I was also not expecting to do (apparently this was not most people's reaction to the film, but whatever, man. I love my superheroes). Was mine the only theater where everyone broke into applause when Thor showed up? Because that was one of the best moments. I also just love how disarmingly certain he is about his own invincibility, especially when he's taking on the heat of the star and Eitri tells him it'll kill him. Thor: "Well yeah, only if I die." Eitri: "Wtf?!" Most surprising death: probably T'Challa's. He, of all people, deserved a more ceremonious send-off, though I appreciated how this film didn't bother giving most characters their big pre-death monologues and epic moments -- it felt more realistic that way, that is, as realistic as a superhero movie about time manipulation and magic rocks can be. Most upsetting death: Gamora's. Dear god. Everything about her story was unbelievably heartbreaking, but to be murdered by Thanos in the cruelest way possible and get no say in how her story ended? I was furious. And don't even get me started on the close-up of Thanos crying. He's a monster, not one worth empathizing with (at least not in that moment). 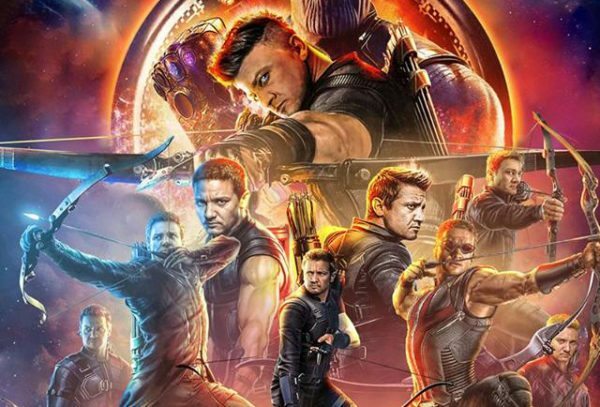 The film didn't feel like it was trying too hard to be funny (unlike, say, Age of Ultron), but it definitely had some of the best jokes and humorous moments that I can remember seeing in a Marvel movie. Squidward, "The Wizard," Rabbit, every time Thor dismissed Peter Quill's insecurities, etc. I loved the idea that Hulk is a separate entity from Bruce Banner, and one that can choose to manifest or not manifest rather than just being at Banner's beck and call. I can freely admit I haven't read many comics, so maybe this is already a well-known fact and I've just been in the dark, but it's a cool idea. Poor PTSD-affected Hulk. I'd nope my way out of a battle against Thanos too. The whole "Dr. Strange sees 14,000,000 potential outcomes and only one where the Avengers defeat Thanos" thing: 1) The only way for the Avengers to come out on top still involves Thanos killing half the universe or 2) Dr. Strange has an uncharacteristic moment of empathy for Iron Man or 3) something else??? I like the idea that he succumbs to the Avengers' mantra of "We don't trade one life for another" and saves Iron Man because he feels for him in that moment, but I'm not sure that's what happened. Can someone just assign Tony Stark a personal 24/7 therapist already? He's been through the ringer and then some. No, this wasn't the best Marvel film ever made. Black Panther beats most of those by a mile, and it's also pretty hard to top the first Avengers movie. But I don't think Infinity War needed to be the best. It brought together a ton of superheroes (a feat in and of itself) and managed to pull off an emotional, entertaining, heart-wrenching, captivating story. That's good enough for me. Okay, that's enough thoughts. I liked this movie. I was traumatized by it. I don't know if I have the emotional wherewithal to see it again. Why does the [ spoiler ] BBcode not work on this forum? I was an admin for manga forums, so it was a must for us. Doctor Strange's personal ego rival's Tony's, he would never sacrifice himself, unless he knew he would benefit in the end and the Universe would be saved. I'd be interested to see if Death makes an appearance in the next movie or so... Thanos needs his girlfriend right now. Not reading any posts but just commenting to say that yes, @AshleyV , that worked! Thank youuuuuuuu! 2. In the options under the Disney Pin Forum logo near the top of the page, click "members" and then "Recent Activity". ~ I can see them undoing most of what Thanos did after the snap (half of the universe disintegrating) but not necessarily some or all of the deaths that came before that - Loki, Asgardians, Gamora, Vision, Wakandans that die in the fight against the creatures, anyone else I may be forgetting). All the dead characters who feature in standalone movies died by disintegration, so reversing just that part would be feasible. ~ I didn't cry, though there were lots of people in the theater audibly breaking down (and cheering when characters - Thor, Black Panther, Star-Lord, etc. - and locations - mainly Wakanda - were shown for the first time, and shouting angrily at the screen) throughout the movie. I remember thinking "poor Omi!" when Loki fell down dead, though. I was expecting something to happen to each of the current keepers of the stones (Loki, Vision, and Dr. Strange), so I wasn't shocked by Loki and Vision's deaths; Black Panther and Maria were the two most shocking ones for me. ~ I agree, the most upsetting death for me was Gamora's. ~ I did like the amount of humor in this, though Peter's constant putdowns of everyone else to make himself look better got old after awhile. ~ I see it more as The Hulk having control over Bruce than being at his "beck and call" (look at the two years that Hulk was out that ended with Ragnarok, and Bruce was afraid to turn back after that for fear he would be lost completely). Bruce has to constantly fight his anger to prevent Hulk from coming out. The fact that the Hulk refused this time was not normal, which may explain why Bruce seemed so off. It was WEIRD for Hulk to not take over when Bruce dropped his guard. ~ Perhaps Dr. Strange sees them getting the gauntlet from Thanos (with Tony playing an instrumental role, which is why his survival was so important) and reversing time, like Thanos did after the Mind Stone was destroyed? Or utilizing some of the other stones to resurrect those destroyed by the gauntlet without going back in time? Since I know that Clint comes back for part two, my immediate thought after the movie ended was wondering who in his family was killed to push him into coming back to seek revenge. 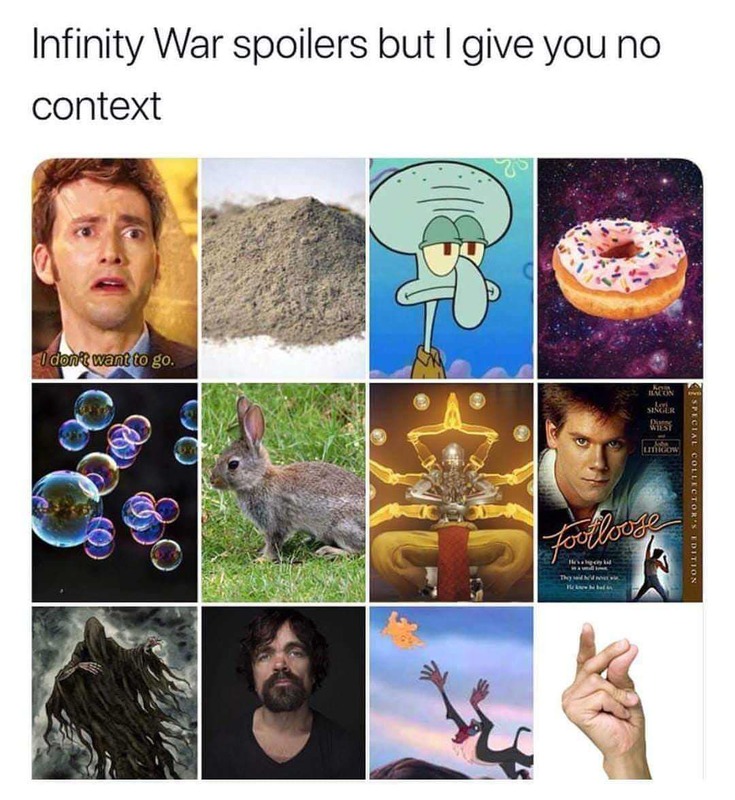 You gotta give it to Thanos, he was fair in letting the deaths be random. It would've been interesting if he too would've disappeared though.